Thank you for joining us on New Year’s Day for a very special morning of prayer! We look forward to praying with you more in 2010. The future of Bristol, the peoples of Bristol, the Governance, Businesses, and for the ministry of the Church in Bristol. There is power in prayer. There is an abundance of power when believers in Jesus Christ unite to Pray and Intercede. This very humble yet urgent appeal comes from the very heart of God: urging His people to unite in prayer at the start of the New Year, to pray together to see His purposes fulfilled in the earth. Your prayer is important. Your city needs you. Please come and join us in answering this call of God on the 1st January, New Years Day for one hour only. Pray-ers will assemble at 10.15 am to commence praying at 10.30am until 11.30am. Please note this is NOT a festival, nor an entertaining stunt, nor an evangelistic venture, but simply a gathering of Christians standing together publicly for the Glory of His name, with strong faith that we will to see our city a safer and better place to live and work in. 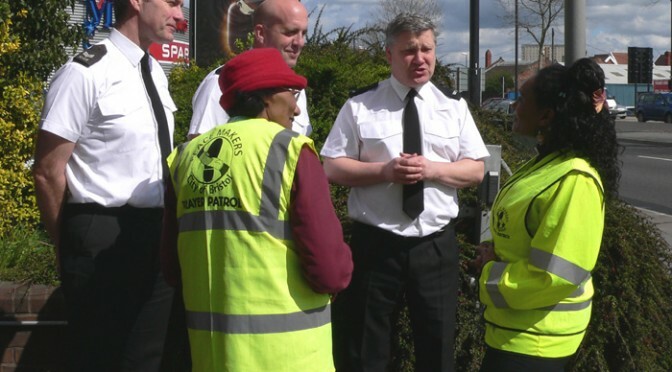 2008 been a very successful year for the ‘Peace Makers – City of Bristol Prayer Patrols. There have been many highlights and new initiatives. ‘Reducing crime and building safer and better communities’ the motto for the Prayer Patrol has truly shined through. There has been significant reductions in crimes over the past year, figures falling well below last year’s. I believe the engine for this drop in figures, has been through the Prayer Force (made up of diligent patrollers challenging and changing the atmosphere). Constitutionally the Management Committee should meet every 6 weeks for committee meetings, but with great diligence from the team, we are often meet weekly. In this way, the team are able to receive continual training and develop new skills. Personal development dates are in place for the forthcoming months. I am very pleased with the representation the patrols have given at various community and national events, and from these many have received Awards. The Prayer Patrol has more than superseded its targets, even though patroller numbers have decreased ( but those who remain have been truly diligent to the work). We are always looking for new recruits. Much of the success of the Prayer Patrol is due to us having a base/HQ. This was launch during last year’s Showcase with a dedication by The Bishop Declan Lang – Bishop of Clifton. The HQ has been a real Blessing for us… It serves many purposes, including office space for our administration work, place for prayer, base for the patrollers to meet and prep before they go out on duty, PP training & development, and a safe environment for community advocacy and conflict resolution. The Prayer Patrol has received small personal donations from individuals; through presentations conducted by our co-ordinator Rev Palmer and an anonymous donor. We could do so much more if there were more funds. This was one of the outcomes from our last A.G.M:- and to that end, we are now planning strategies around sustainable self -generated funding.